Fine a little fresh with late afternoon rain. Our lodgings in Caraz were so comfortable we stopped there till 1200, though we had plenty to do. It was great to have a bit of a rest. Riding along today my thoughts drifted to the people we see on the roadside. Most women are dressed traditionally. Most are greeted along the way. The people here, their dress and their activities are now common place for me, there’s most certainly no need or desire to photograph them. Firstly, for me it is very rude to do so and secondly, a warm greeting received is so much better than a photograph could ever be. The Peruanos in the rural areas, like all people, love a strong and warm greeting with an open smile. They probably think I’m crazy, returning a similar gesture is the least they can offer. Though I feel, with guys around my age and older there is a little respect. This I enjoy, though, receive it with a humbleness laced with respect in return. The woman wear just the most exquisite hats, brimmed and high. On the right side is an embroidery, flower, or other design. They have an air of dignity about them whether they are carrying a load of cuy feed or a baby or just going about their business. Roadside two ladies, were standing together, both I guess in their late seventies. They had faces wrinkled, though strong facial features revealed, an old friendship as they both looked at me. Here, were these two women who had most likely worked hard all their lives, dressed in traditional skirts, black alpaca tights, black slip on shoes, hats and brightly coloured above the knee spreading skirts. Their legs fell from these skirts like those of a marionette puppet. This scene typified the kind of ambience with the people here. Everyone seems to have time for actually just hanging doing nothing, anytime of the day. People are often never talking. With that time they are only too willing to return greetings and offer help if needed. The feeling, “oh they are to busy to help” very rarely arises. 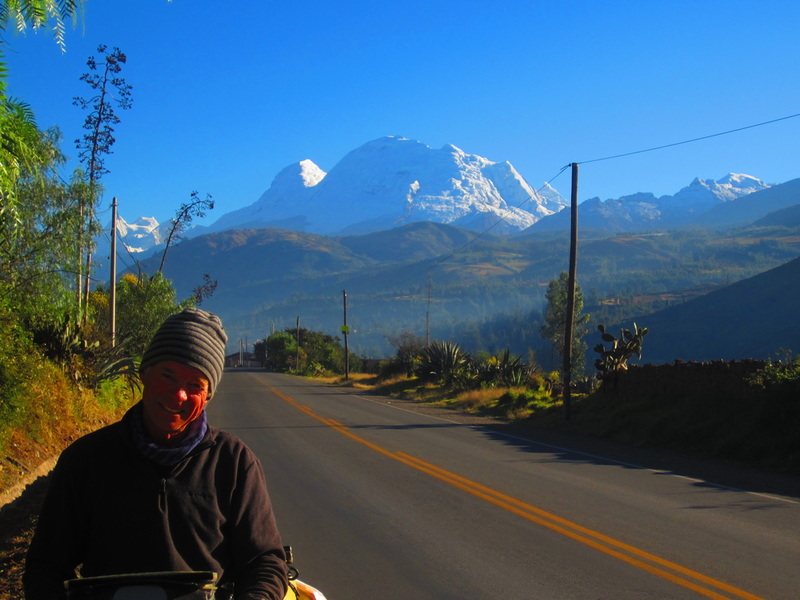 The scenery was now very rural with easy hills both sides of the road, though to the east in the background were alps of the Andes draped in what appeared to be fresh snow. Now that we are close to 10°S of the equator, altitude will equate to snow, unlike everything north of here, except for Cotapaxi in Ecuador. At Yurasoto, a shanghai (Ondilla) was bought to kill birds in case we get hungry in the mountains in the next few days. No!! The rubbers were used to run from the front rack to the handle bars under the bar bag to ease some weight off the mounting bracket. A great ides given to mr by the French guy a couple of days ago. Thinking we may have to camp water was bought. Soon the rain started. We needed to find some shelter. I checked out a farm house. Deirdre thought we should ride on. It was a good call, for a kilometre on was the town of Carhuaz. We had a good look around and as always not wanting any motel that has a staircase, the first place inspected was returned to and we took up residence, all be it just for the one night. It was a classic affair, two beds and not much more room. We cooked some soup and had tuna on crackers out the back amid roosters and hens. The whole night the roosters crowed and there were people trying to get in the front door, hammering whilst trying to get the attention of the owner within. Mind you for six dollars it was way better than pitching the tent in the rain. We walked into town for the evening, enjoying just the best ice creams and the view of the mountains east of the central park. Bread was bought for tomorrow. I am sporting some kind of throat cold, which is a pain, as breathing through the mouth all day riding, leaves my throat dry and sore. Some energy otherwise used to ride has been sucked up by this ailment. In the rolling hill country today, it was no problems, In a couple of days time this will change, like wise I hope with this annoying little problem. Getting up early, for two reasons, one of which was to vacate the den. 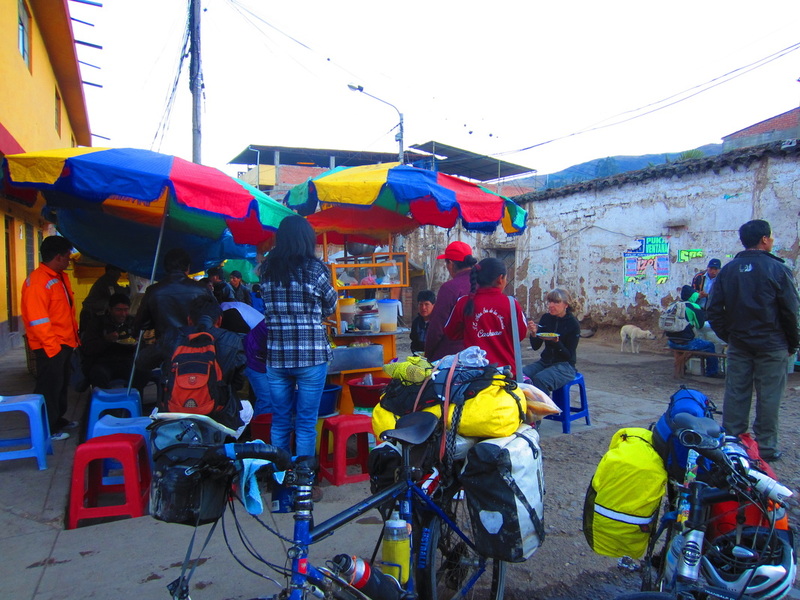 Heading up into town we found a great roadside stall with a crowd enjoying, Quinua, a warm herbal brew made with apples among other things and rice with eggs or chicken. The mountains to the east were now very visible and very white with fresh snow, there was a cool nip in the air. So much so my hands were relieved of their feeling very soon into proceedings. We were on the road by 0630, it was understandable. I had to borrow Deidres mittens. Not far on we stopped at Yungar and enjoyed more Quinua. By now Deirdre was stripped down to a singlet. A beany, sweat shirt, neck warmer and gloves still saved me from the chill factor on the move. We laughed about this, now let me tell you, Deirdre comes from a town called Smithers, 15 hours drive north of Vancouver. To say she is used to the cold, only lightly explains the situation!! This was tepid in her world. It was an easy ride, even though the road had little shoulder and traffic was heavy. 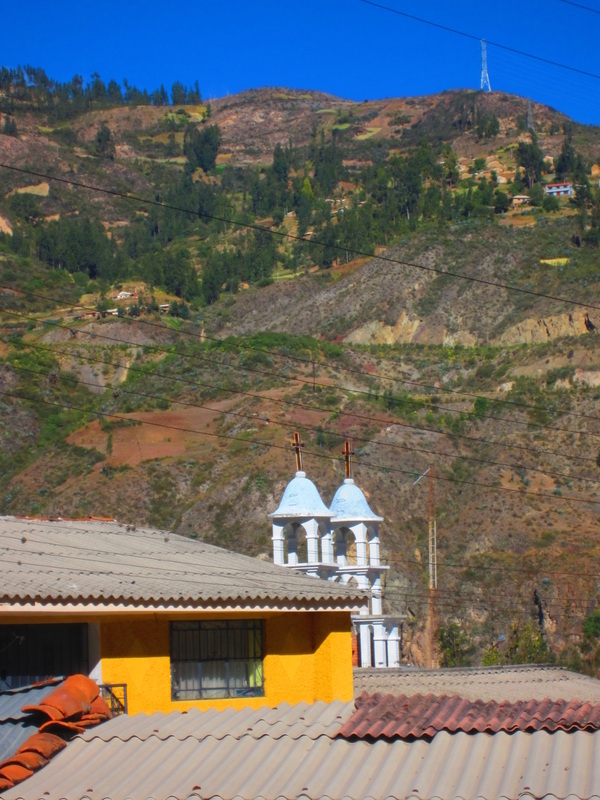 Small towns were encountered all the way to Huaraz. Arriving bout 1130, we found a humble but really comfortable hostal. 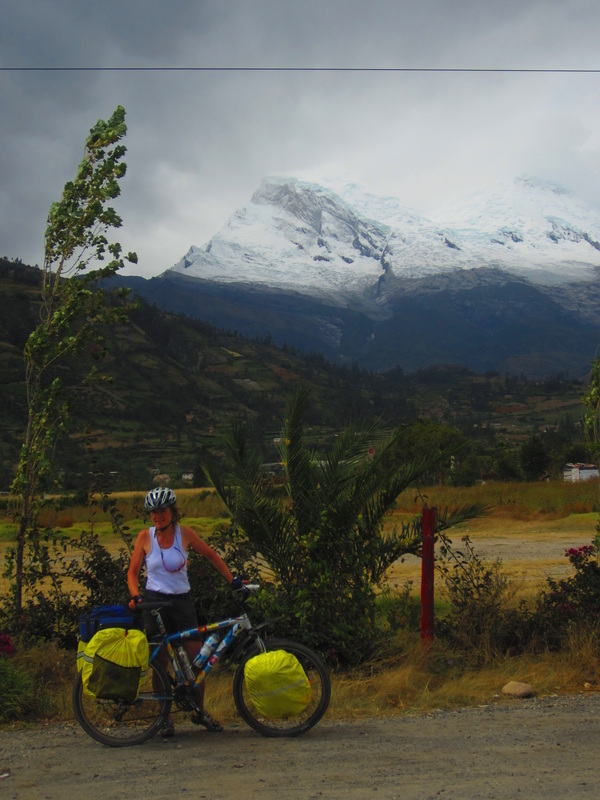 Huaraz is a touristy place, it serves as a bit of a trekking staging point for people. It is quite a large centre with a huge retail area, all framed by the white mountains to the east and the vegetation clad hills to the west. We spent the afternoon buying food. A great Ceviche was had at a Cebicheria called La Caleta. Some good warm gloves were bought as was a new MSR fuel bottle, the Whisperlites use a bit of fuel I might add. Dinner at a pizza place was enjoyed, a gringo hang with prices to match.